One of the fun things about being a boat reviewer is having an opportunity to experience the industry’s latest design trends first-hand. Case in point: the Jeanneau 51, which I recently helped deliver to the Miami boat show, is very much an evolution of the Jeanneau 54 that I sailed a year or so ago on a short cruise off of South Florida. 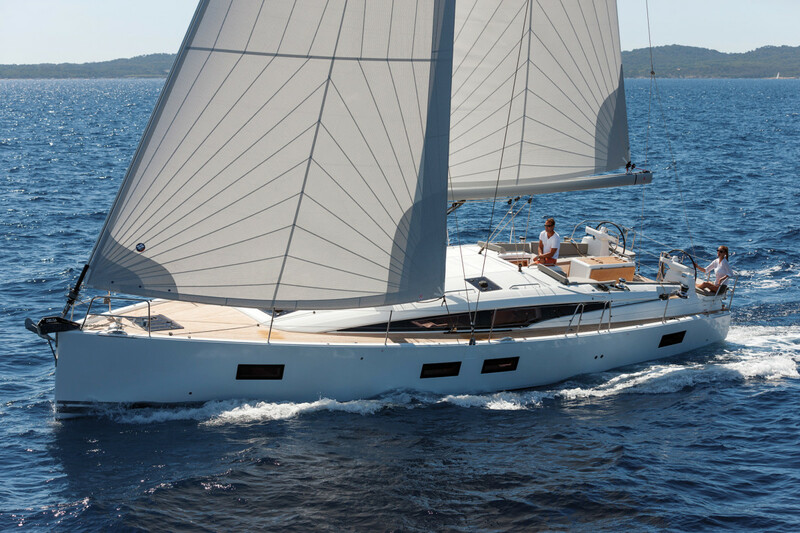 As such it was fun to see how Jeanneau incorporated many of the ideas that make the 54 such a winner into a slightly smaller package. 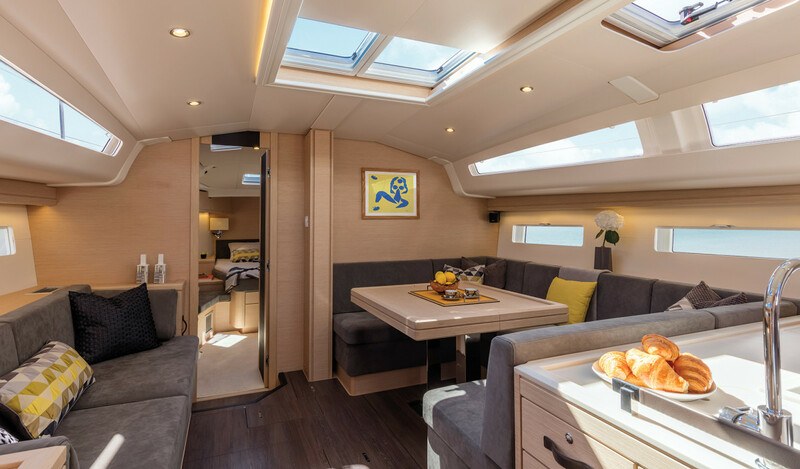 The Jeanneau 51 boasts solid, hand-laid construction with a laminate schedule that includes two outer vinylester layers to stave off blistering. Bulkheads are integrated into the deck and hull structure through the use of polyurethane adhesives, while a molded structural grid works to further tame the rig and keel loads. Because the cored deck is built in a two-part injection mold using Jeanneau’s proprietary “Prism Process,” it not only boasts an optimal resin-glass ratio, but displays a nice smooth finish both abovedecks and below. The canoe body is fairly conventional for the current generation of French-built cruisers, with a plumb bow in the interest of maximizing sailing length and chines aft to help the boat dig in under a press of sail. These chines set off an elegantly angled reverse transom that houses a massive, articulated, split-level swim step, a la the Jeanneau 54. The transom also nicely complements the low and carefully sculpted cabintrunk and cockpit coaming to make the boat’s lines quite pleasing overall. Winches aboard our test boat were Harken, stoppers came from Spinlock, nav electronics and the autopilot were by Raymarine, and the 110 percent Technique Voile roller-furling genoa flew off a Facnor furler. The boat’s deck-stepped double-spreader rig includes a Z-spar aluminum mast and is slightly fractional, with wire rigging and mid-boom sheeting. Our test boat came with in-mast furling, a good idea for shorthanded sailing, although a full-batten conventional mainsail is also available that should really make this boat fly to windward. Two different L-shaped keels are available, drawing 5ft 8in or 7ft 5in. No matter what your keel, the Jeanneau 51’s wonderfully large single rudder will ensure the boat remains under control under a press of sail. Both keels are fabricated in cast iron and encapsulated in epoxy. Topside, comparisons to the Jeanneau 54 also abound, foremost among them in the cutouts in the aft cabintrunk bulkhead that extend the cockpit benches a foot or so forward of the companionway. Thanks to the security these cutouts offer—not to mention their being cozily tucked up under the dodger—they were once again the place to hang out during our delivery, the same as they’d been during my brief cruise on the 54. Farther aft, a less obvious but no less important design feature is the 51’s well designed twin helm stations. Because they are set a fair ways outboard of the split backstay providing access to the aforementioned swim step, there’s no problem with it digging into your shoulderblades when driving on the wind. Sightlines are excellent, the cockpit table includes a dedicated space for liferaft storage, and the helm seats are both hinged to swing out of the way of the swim step at anchor. Moving forward, chainplates are set outboard, and the genoa tracks are set in close alongside the cabintrunk in the interest of close sheeting angles. This arrangement also leaves the sidedecks—which are enclosed in a low bulwark/toerail for safety—nice and clear. Finally, up on the foredeck is one of those features I now consider a kind of a litmus test for a truly effective cruising boat—an absolutely massive locker complete with a ladder and lighting for storing sails, fenders, mooring lines and other bulky gear. 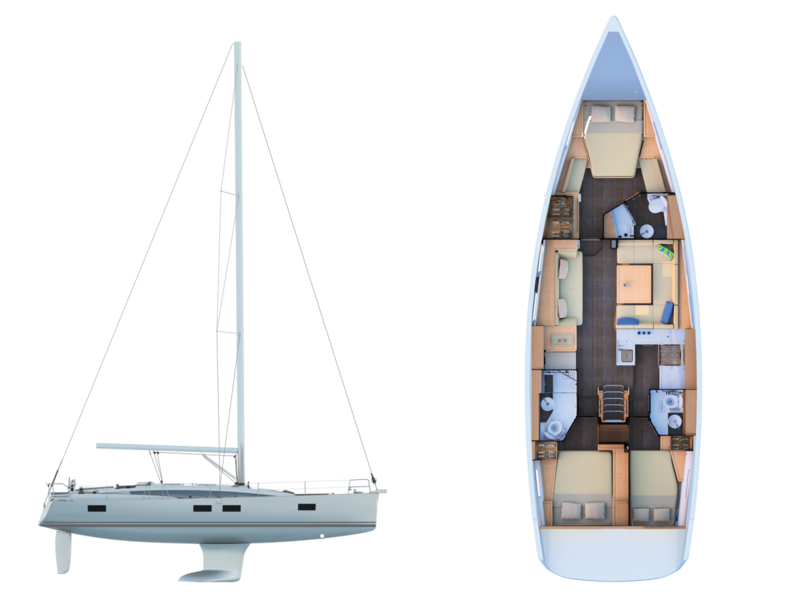 Belowdecks, the Jeanneau 51 is available with either two or three cabins and/or two or three heads. A moderately sized nav station is to port, and a C-shaped galley equipped with an Eno oven/stove unit is to starboard. Aboard our test boat, we had three cabins, but the aft head to starboard had been given over to a laundry room—a much better use of space in my opinion, especially for those planning to do any kind of extensive cruising. The starboard-side quarterberth can also be swapped out for a dedicated storage area, another good idea for bluewater cruisers. Overall, the accommodations arrangement is fairly straightforward, with adequately long settees for crashing out in the saloon while on passage. The owner’s cabin forward is especially nice, with a generous double berth that measures in at nearly 7ft long and a generous hanging locker. I especially like Jeanneau’s use of double hatches overhead in both the owner’s cabin and the saloon to admit scads of light and fresh air. One quibble I have is with the overhead handrails in the saloon. I know it messes with the overall aesthetic, but I like big beefy handrails, as opposed to the somewhat camouflaged “lips” found in the deckhead of the Jeanneau 51. That said, as “lips” go, the ones on the Jeanneau 51 are at least plenty robust, as opposed to those I swear I’ve come close to inadvertently tearing off when I’ve given ‘em a good hard yank at boat shows. The overall quality of the joinerywork is outstanding for a modern production boat, thanks in no small part to Jeanneau’s use of CNC cutting machines that can turn out parts to as close a tolerance as even the most experienced craftsman. Alpi Natural Oak with an “open pore” varnish finish and Alpi Teak are available as options. At this point, some may wonder why even bother with the Jeanneau 51, when it shares so many characteristics with its 54ft predecessor? The answer is manageability under sail. Never forget that volume, displacement and therefore overall loads increase at a much faster rate than LOA. This, in turn, means that even a slight increase in “size” can result in a major increase in the demands made on the crew. For example, while the Jeanneau 54 is only a few feet longer, it displaces an additional 3 tons! As a result, this meant that during our delivery, our four-man crew never once felt the slightest bit taxed, even when the wind picked up. Not only that, but despite being pressed for time, we still very much “sailed” the boat, tweaking and trimming our way down the coast as much as possible, as opposed to just putting the pedal down on the iron genny—even when the wind went on the nose. Indeed, among my fonder memories from that trip is beating/close-reaching on starboard tack about 30 miles off Jacksonville, Florida, plowing along at 7.5 to 8 knots in 15 knots of wind. Even when we found ourselves bucking a fair bit of Gulf Stream current, we kept at it, employing wind power as much as possible till our breeze finally disappeared completely. The boat is that much fun to sail. Equally satisfying was the 51’s motion through the chop we encountered after setting out, especially after the sun went down. Seakindliness is an increasingly under-appreciated aspect of naval architecture as designers strive to maximize accommodation space. However, the Jeanneau 51 did just fine, powering through the waves as opposed to vaulting over them and then landing on the other side with a sleep-shattering smack. With its large rudder and bow thruster, maneuvering the Jeanneau 51 in and out of the fuel dock in Hillsboro Inlet was a snap. Equally important was how well the boat did motorsailing on our second day. With just the main up to steady things out, we clipped along at 7.3 knots with the engine turning over at 1,800 rpm. Engine noise was well within the acceptable range as we knocked off the miles toward our destination. I’ve long believed less is more when it comes to sailboats, and the new Jeanneau 51 no exception. It’s a great size for a cruising couple or anybody interested in taking some of their less experienced friends out for a cruise. In addition to being a comfortable passagemaker, the boat is also a lot of fun to just sail around for the heck of it.